In the village "Paredes de Buitrago" house Sun and Moon House are located. Both houses are newly built and have everything you need to keep warm in winter and keep it cool in summer. 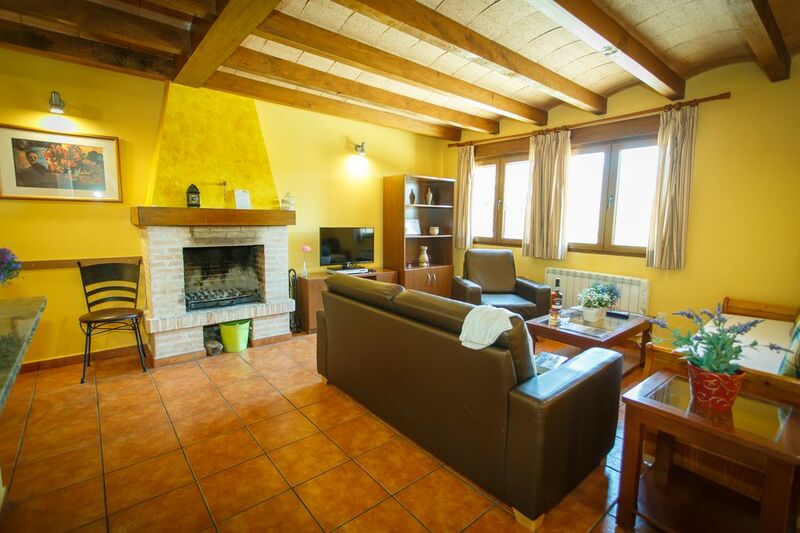 La Casa Sol has low plant a lovely living room with fireplace, flat screen TV, DVD, equipped for 6 seats. American kitchen with hob and oven with grill, large refrigerator, dishwasher, toaster, blender, coffee maker, juicer and all enceres to enjoy a good meal oven. We also find a comprehensive Toilet equipped with washing machine. Upstairs are 3 bedrooms with beamed ceilings and spacious closets in each room. One room with double bed and balcony, the other with two single beds and finally one with a single bed. All have quality mattresses to ensure the rest. On this floor there is a full bathroom with tub. The Casa Luna has low plant a lovely living room with fireplace, flat screen TV, DVD, equipped for 4 people. Has kitchen with hob and oven with grill, large refrigerator, dishwasher, toaster, blender, coffee maker, juicer and all enceres to enjoy a good meal. We also find a comprehensive Toilet equipped with washing machine. Upstairs there are 2 bedrooms with beamed ceilings and spacious closets in each room. One room with double bed and balcony, and one with two single beds. All have quality mattresses to ensure the rest. On this floor there is a full bathroom with tub. * Sheets of quality kitchenware, refrigerator, stove, microwave oven, coffee maker, juicer, toaster, tea towels. Oil and vinegar, salt and sugar. Welcome breakfast tray for all occupants. * Sheets, blankets, quilts and comforters, wardrobe and / or chest of drawers, bedside tables and hangers. * Bathroom: sink and bath towel. For small have cots, baby bath and covered miniature. * The houses have central heating, which ensures the ideal temperature in all rooms. The fireplace is to feel the pleasure of watching the fire (the houses have wood). * There is housekeeping and laundry for longer stays. * Subject to approval allowed animals. See additional services, meals, breakfast, and rates. Cando llegamos nos dieron las llaves y nos dejaron un desayuno de bienvenida para todo el finde semana. Un pueblo muy tranquilo que es lo que buscábamos. Repetiremos sin duda.